For a few years Darrell and I had talked about working together on a project. We just needed an idea. That idea came this summer: we would write an ebook about the subject we know best â€“ our lives together. However, this idea caused Darrell great trepidation. He is not a writer; writing is painful. Yet, he trusted me to move forward with the idea; a trust I did not (and do not) take lightly. We decided on a question and answer format, so that our readers would, hopefully, feel like they were sitting around the table, chatting with us. Once we came up with the list of questions, we each wrote our responses separately. Response by response, the ebook was written. A light editing was then applied to correct the grammatical errors and yet still maintain the rawness and truthfulness of our words. We are happy to announce the release of Seated in Empowerment: A couple’s journey with cerebral palsy through life, marriage and success! 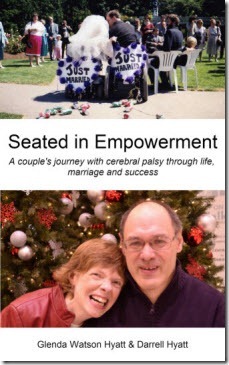 Glenda and Darrell both have physical disabilities, specifically cerebral palsy. Both are unable to walk independently, Glenda does not speak clearly. Between them, they have the equivalent of two functioning hands. But that doesnâ€™t define who they are, neither does it hold them back. Despite various medical professionals saying these two individuals wouldnâ€™t amount to much, they fell in love, got married and bought a condo. They struggle with the unenlightened attitudes of others, needless physical accessibility issues and household chores. Through it all, they keep a sense of humour and determination, and a deep love and admiration for one another. What is the one thing they would change about themselves? How do they make life and marriage work? What do they see as success? 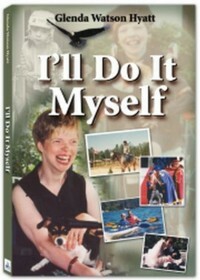 Seated in Empowerment is available on the Kindle. However, you do not need a Kindle to read this and other ebooks. Check out the many ways you can read Kindle books. At the moment, Seated in Empowerment is only available in electronic format. I still need to check if the book is long enough for CreateSpace, the print-on-demand arm of Amazon. (Our ebook is a quick read.) If you would prefer a printed copy, please let me know in the comments below. That will indicate to me whether looking into CreateSpace should be higher on my priority list. Please welcome Darrell into the world of published authors on Amazon; a world he never envisioned himself entering. I am so proud of him!